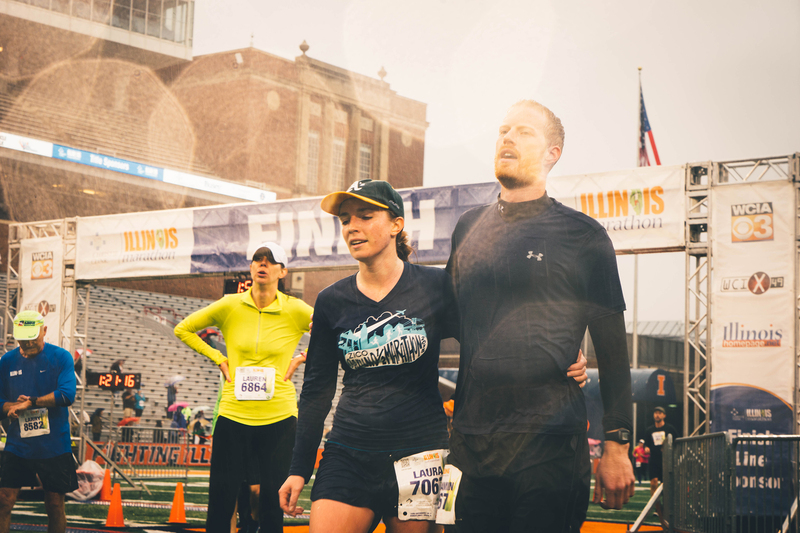 The Illinois Marathon was a cold, soggy, character-building run that brought you back to your childhood and across the 50 yard line to taste sweet, sweet victory. For race pictures, contact us. How did you like running the Illinois half marathon? I enjoyed it. It was grey, overcast, probably in the 50s, and rained constantly. There were a lot of puddles of water along the course, some people avoided them and others ran through them but it really didn’t matter because you were soaking wet within the first half mile—it brought you back to your childhood. I ran slowly at first and stayed with my two sons—I took off a little too late to reach my goal. I wanted to get a personal best and got a personal okay. It wasn’t a personal worst. My goal for the half marathon has been to get under 2 hours. One year I finished 2 hours and 1 minute and thought, “if I only sped up at the end I would have done it.” This year, I finished 2 hours and 5 minutes—getting close. Did the weather prevent you from reaching that goal? No, not at all. I could use it as an excuse I guess [laughing]. I enjoy running in all kinds of weather. Not sure which type of weather enhances or retards my running abilities but my enjoyment never changes with the weather. Will you retire your running shoes when you reach your goal? [chuckles] No, my goal keeps changing. A good goal is just out of reach—2 hours seems just out of reach. I should be reaching for an hour and 50 minutes, but that seems way out there. Alternatively, you can set a goal that you will never reach and keep shooting for it, but I usually set a time and try to achieve that. Once you reach that number, go faster. I don’t know which approach is better, but my next goal will be higher and loftier, so yeah, no reason to stop—not sure why I’d do that. Run until you can’t run anymore? Pretty much. Looking at the other runners in my age bracket and the people in the 70 and above group, you can see how people get weeded out by age. Things don’t work as well when you get old but I’ve been extremely fortunate so I look forward to running into my 70’s and being the first in my age group, because everyone else is either dead or can no longer run. I noticed you came in the top 10 in your age group, that’s got to be an awesome feeling? Coming in first would have been an awesome feeling [everyone laughs]. No, it’s great coming in 10th but it’s just a personal thing. It doesn’t really mean anything to anybody other than the person setting the goal and running. No. [laughing] I looked at the time and that was it. I’m not trying to do something profound—running is just something I do—it’s just running. The physical nature of it and the challenge to go faster and farther. I feel good running and I feel good afterwards—I look forward to it. I always enjoyed running and I’ve been fortunate in that my knees and joints cooperate. Running is just something I’ve always done and always enjoy—I’m addicted to running basically [laughing]. What’s your history with running? It goes back quite some ways. I started running in grade school but I never did it competitively. I grew up in a small town in Streator Illinois, we were right across the street from Vermilion River. I spent quite a bit of time hiking and running in the woods along the river. It’s always been something I enjoyed. After high school, I went to college and was on the swim team and ran to build up our endurance and lungs. After that, I ran on a regular basis usually a couple miles and sometimes 10 or more. Since I was training so much, I decided to enter the Moab Half Marathon, I think it was 1978 or ’79. That was it for a while and then the Illinois Half Marathon started 7 or 8 years ago and I’ve been running that every year. What do you think about while you’re running a race? I look at the people and the environment a little bit more. I also think about pace, the mile markers, whether to stop for a drink, or eat that sugar-loaded chocolate stuff. Running a race is a lot of fun, it challenges your body and you get these moments of introspection. What do those moments of introspection feel like? It’s almost like meditation, very calming and relaxing. Your mind wanders but you don’t feel anything external anymore. Sometimes I’m able to totally empty my mind and run along in a REM-type sleep state where you’re not thinking about anything in particular. You float along and then you’re jarred back into the race. It’s a very nice moment. What was going through your head when you crossed the finish line? [laughing] I think you get like that when you’re old. You cut away the things that don’t matter in the long run. There was a couple that held up a sign for me at mile 10 that read, “Go Panno!” The guy just got out of the hospital after getting a kidney stone surgically removed and was in a considerable amount of pain. It was touching to see him out there withstanding the weather. It’s nice to have friends like that. Crowd support makes it a lot of fun and is part of the festive race environment, but if there was nobody out there it wouldn’t matter. It seems running is more of a physical challenge than a mental one for you? Yeah, it’s a little bit of many things. For me, it’s comradery, recreation, entertainment, and something I really enjoy doing—it makes me feel good about getting up and moving. If it was just a challenge, I’d get bored of it after a while and wouldn’t want to do it anymore. Mentally? I never worry about the mental side and I don’t think about the distance at all—it’s never been something that preys on my mind. Go out and run as hard as you’re supposed to and then you’re done—eat something, shower, relax, and feel good. It’s sounds so self-evident when you explain it, does that mindset only come after a lifetime of running? That’s part of it, the other part is that I’m not driven to be first. I do the best I can and go for the best time I can possibly get. Winning a race like that is beyond possibility right now. Maybe when I’m 70 I’ll win my age category, but who’s going to say anything about it other than maybe my wife and a few friend? That’s not the reason I run. Getting an award isn’t something I work towards because it seems like the wrong reason for doing something. What advice would you give someone new to running endurance races? My advice is similar to my running philosophy—just enjoy it. Take it slow, stay on schedule, and work up to it. When people first start out, they try to run 5 or 10 miles and pretty quickly fall off the schedule and pace. Work your way up to a mile and if you’re up for it run a mile and a quarter or a mile and a half, but stay on schedule. Some days you will wake up and won’t feel like running—put on your running shoes and walk outside. Once you’re in the running environment you’ll think to yourself, “oh, I might as well run,” and you forget about being tired and hungry. Probably, not. I think of a runner as someone who is really good and focused on it. This is kind of a fun thing for me even if I do it a lot. I do a lot of fun things. [laughing] You’re a fun guy! Shorts [laughing]. I could live without a shirt but I need socks, shoes, and shorts. There was a guy wearing a Superman t-shirt underneath his white collared shirt—buttoned halfway up with a tie. I’ve seen people dressed as Superman, but to see him with his shirt open and a big red ‘S’ was great.